Munich. As a provider of premium mobility products and services, the BMW Group is constantly in search of answers to the question: what will move us (forward) in the future? In the past, the BMW Group has already presented pioneering solutions for future individual mobility with a range of different concept vehicles as well as the visionary studies presented to mark its centenary. As part of the strategy NUMBER ONE > NEXT and in view of the challenges to come, BMW Group developers are working on visionary mobility solutions that go well beyond established conventions. BMW Vision E³ Way – emission-free two-wheeler mobility at a new level. Developed at the BMW Group Technology Office China in Shanghai, the BMW Vision E³ Way project shows a visionary mobility concept that is designed not just to specifically address the challenges faced by megacities – such as traffic congestion and air pollution – but to provide a solution that is both simple and effective. 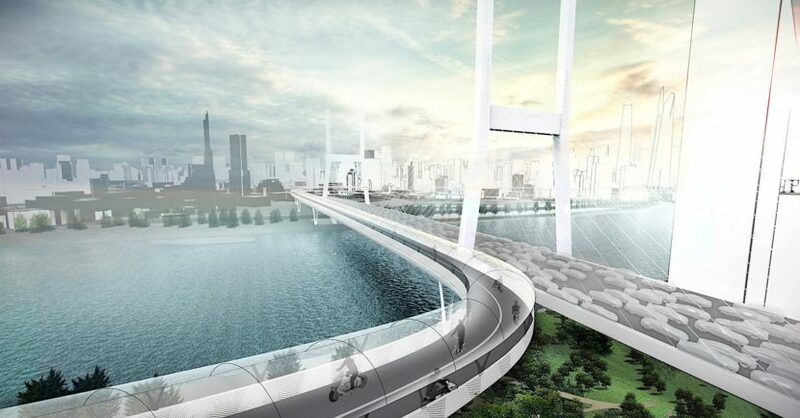 It consists of an elevated road concept for electrically powered two-wheel vehicles which links key traffic hubs in urban conurbations. The three E’s stand for “elevated”, “electric” and “efficient” – the concept’s defining properties. The use of roadways that are elevated above existing roads means the project generates additional traffic capacity. The BMW Vision E³ Way is explicitly conceived for locally emission-free single-track mobility concepts only (“electric”), such as e-bikes, the BMW Motorrad Concept Link and the recently presented BMW Motorrad X2 City – likewise developed by the “Research, New Technologies, Innovations” division. The elevated road is simple and modular in design, economical to build as a result, and provides a fast, direct link between key traffic hubs, making it the perfect alternative for commuters travelling up to 15 km. This makes use of the elevated road very efficient not only in terms of cost but also as regards travel time (“efficient”).